Starting a new thread sicne issue 1 iso ut today.I won't be doing separate threads for each issue but I thought a fresh one today is good idea. I'll have my copy probably Friday. 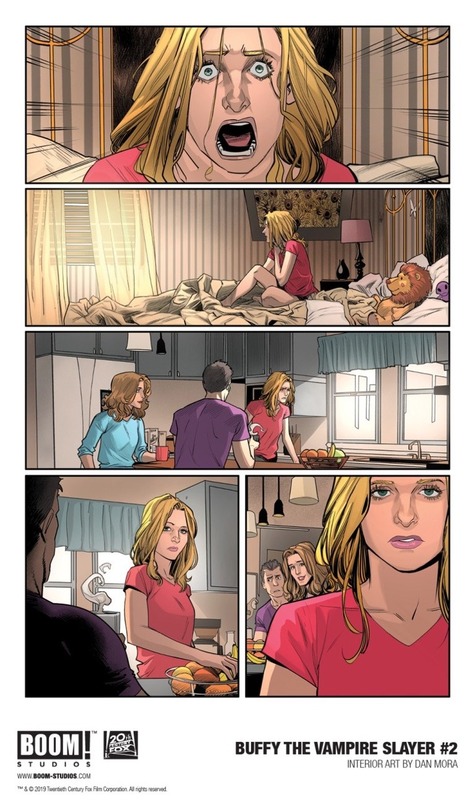 Interview with Buffy comic writer and editor.Head to link to see larger versions of the new preview pages. 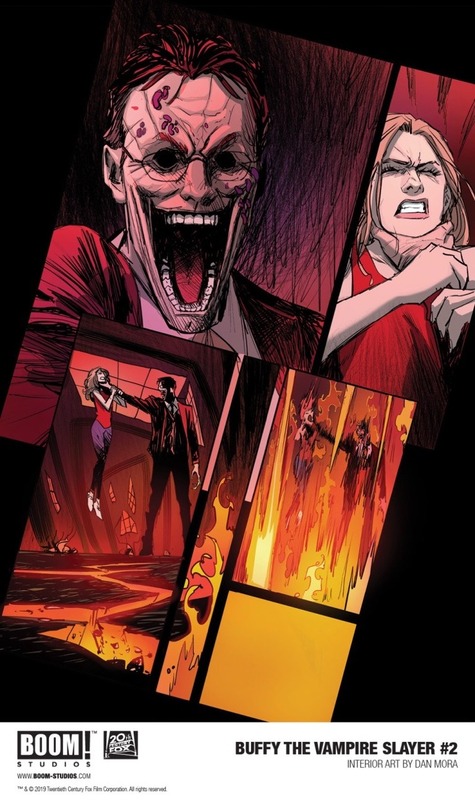 Spoilers ahead for this week's Buffy the Vampire Slayer #1. 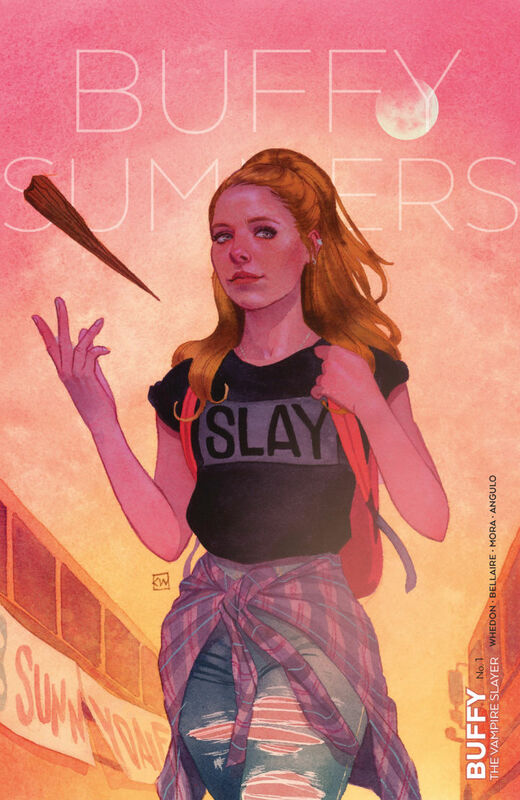 This week's Buffy the Vampire Slayer #1 comic book returns to the classic Sunnydale High drama which made the cult-favorite TV series a hit for high schoolers of the time, with writer Jordie Bellaire and artist Dan Mora transposing it to modern times for high schoolers of today. Unlike Dark Horse's previous years-long run which focused on stories after Buffy's TV series finale, BOOM! 's Buffy will exist alongside the classic episodes TV but add fresh layers, context, and drama. Newsarama spoke with Bellaire and editor Jeanine Schaefer about this week's #1,what's to come, as well as continuity questions with the show and the overall impact it had on modern culture. With this, we have covers, character sketches by Mora, as well as pages from February 27's second issue. 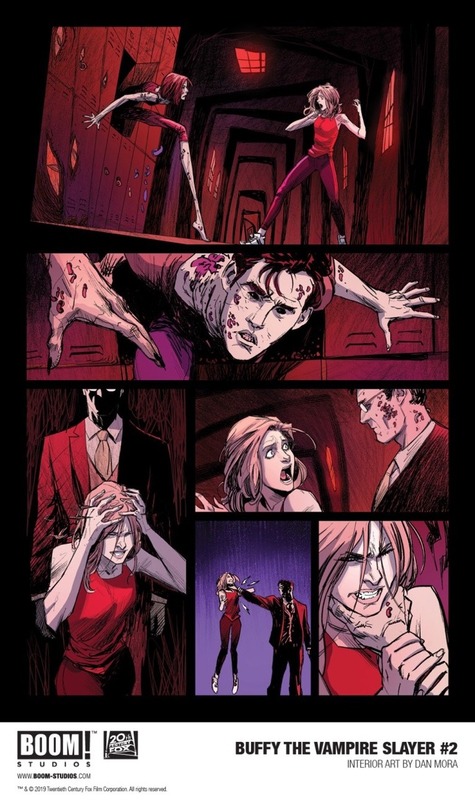 Newsarama: Jordie, Jeanine, what modern changes are you making to the Buffy franchise? Since the title is not exploring teens of the 1990’s but now teens of 2019. Jeanine Schaefer: I think everything changes. I think the joke is – oh you’re updating it now there’s just cellphones. Kids have a much different outlook on things than kids in the 90’s did. The concept of being a teenage and the concept of just being a human being and those connections don’t change much, but the ways we understand that stuff changes. The ways we understand identity and connection changes. This changes the way our characters are going approach stuff, that said I think spiritually they’re the same people. Just the way they react to stuff and the way they are able to interact with things changes. Jordie Bellaire: I want to reiterate what Jeanine was saying about connection, to say teenagers of today are the same as teenagers from 1994 or 1997 is really not the case at all. I think young people today are far more connected and far more in the know on politics and on culture as a whole, and that’s where these characters are going to come from too. I can’t tell you how cringe-worthy it would have been if Jeanine would have been hey do you want to write Buffy, and let’s make all these cellphone chats happen. I would’ve been like this is horrible and I couldn’t be part of that. So it’s definitely not just a technology thing. I think the minds of people have changed since we’ve become more connected for sure. Nrama: In the television series Willow’s queerness is not really touched upon until later seasons. Do you want to explore this with Willow in her high school days? Bellaire: Jeanine put to me best when we first started talking about it, being queer in the 90’s is a lot different than it is now. Again I think we are talking from a more connected place where children, teens, and adults can feel more comfortable because they have more groups, more people to talk to, and to be more honest and open about who they are. I would hope so any way, in comparison to how it was in the 90’s. So I would say the things with Willow will become a lot more apparent. Things will happen sooner the way I think is appropriate for today really. I would hate to have her buried and hiding. We want her to be confident and fully herself. Schaefer: Not that the coming out story isn’t relevant, but I think we wanted to explore other facets of that for modern teenagers. What is it like to be queer and out as a teen? What does that look like? What challenges do you face? I think it opens up spiritually in line with Buffy. What kinds of things she has to deal with on that end. Nrama: What made BOOM! want to bring Buffy back to her high school days? Schaefer: Dark Horse did such a great job exploring so much of Buffy. So many facets of it. They touched on such a wide range of the universe, and had taken her so far. We kind of felt like I don’t know what else we could do in that universe. We thought it would be fun when we first started talking about it, how do we spiritually keep this a Buffy book - the theme of it and the characters of it are so relevant still. 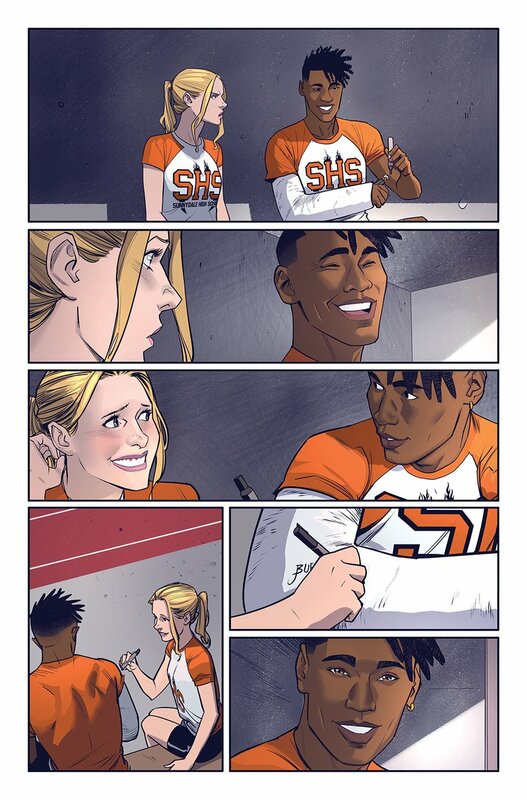 The stuff they talk about, like Jordie was saying, the issues of connection and relationships and questions of identity, these are still so relevant that we wanted to give kids of 2019 a Buffy that kids in the 90’s had. Nrama: There are so many great character journeys in the Buffy franchise, which is one of the many reasons why the series still resonates with so many people, but one of my favorites was the character growth of Cordelia. Are we going to see some of Cordelia’s layers that was established in Angel and the later high school seasons in your series? Bellaire: You are speaking my language. Cordelia became my favorite character. Her journey in Angel is especially wonderful and beautiful, and I really think she’s an interesting character. I’m definitely excited to say I will be bringing her into the fold, and more in line with what it sounds like you and I were interested in about Cordelia. It’s those layers. It’s not just that she’s this angry, mean, beautiful woman, but that she’s actually a very sincere, kind, compassionate person. I think that’s much more interesting. Nrama: I’m very happy to hear that. Cordellia doesn’t get enough love. Bellaire: I flipping love her. She’s legit my favorite. I adore her. Nrama: Do you feel like this series has to be restrained by continuity? Schaefer: Oh no, not at all. I think what’s awesome about it is that we get to quote on quote update, and we get to play with dramatic irony. The continuity of Buffy is so rich and so wide, and there is still so much opportunity to explore it. I think we are really excited about using the dramatic irony, and subverting some of the stuff and enhancing some of the stuff. I think it’s great. I’m really excited. Nrama: The series is diving into the very early days of Buffy the Vampire Slayer, but it looks like some characters from later seasons are already making their appearance, like Anya. Do you plan on exploring storylines from future seasons through the lens of their high school years? Bellaire: Future seasons through their high school years? I guess so. I’m not going to be borrowing stories and looking through the high school lens, much as I am taking characters from later seasons that I find interesting and adding them now. Where does Anya fold in now? Nrama: Speaking of Anya, what can we expect from her for this initial arc? Bellaire: I really like Anya, she’s one of my favorites. It’s hard because everyone on Buffy is my favorite, but Anya is also one of my favorites. I can’t get over how much I adore Anya. So I really like Anya as this ancient, demon, badass lady. She’s going to have a big part to play and very interesting insight to all things Hellmouth and Slayer that I think she previously hadn’t had before. I want to make her very powerful. I love her, she’s great. Nrama: Do you think there’s a possibility of more Buffy-related series? Maybe an Angel title? Schaefer: We have a super robust, publishing clan. We have a lot of ideas of what we could do. So we have ongoing conversations about that. Right now we are really excited exploring who Buffy is and digging into this, but we have some surprises coming up our sleeves. Nrama: Has there been any collaboration with Joss Whedon? Schaefer: Joss was really involved early on. We sat down with him, and went over the plot and walked him through everything we wanted to do for the first year. He really gave us his blessing and was really excited about the changes we wanted to make. He had a couple of hard questions for us that he needed us to answer, and he was happy about how we were able to do that. So you will see those things peppered trough. Nrama: Can you tease some of the character arcs that will be explored in this series? Bellaire: I want to be careful because I don’t want to ruin things for readers. I actually just met up with this wonderful lady, who is a huge Buffy fan, and she wanted to know things and I felt horrible telling her what I had planned because you can tell she wanted to hear, but she didn’t want to hear. So I guess just expect new character arcs, and some things you haven’t seen before that might take you different places. I don’t want it to sound so stupid, but I don’t want to ruin things. Schaefer: I know. I think when these big emotional points are revealed - it’s funny because we talked a lot about well what’s the plot. What’s the physical plot? We kind of knew what that was. We were more interested in the emotional arcs driving that physical plot. There’s a couple of things, you’ll know it when you see it, where we will say this is what we are talking about. These are going to be some huge changes to these characters that we can’t go into unfortunately. But when those changes happen you will see how that drives both their emotional arcs and the actual physical plot. Bellaire: Yeah, because it’s like you said earlier Buffy is really character-based stuff and that’s what makes it so good. That’s especially what me and Jeanine are leaning on. We aren’t leaning on any of the stuff that happened before. We want to do new stories, and because they are so character driven if we said even one thing I feel like it would ruin the surprise. Nrama: Dan Mora has worked on other high school books with BOOM!, one being Go Go Power Rangers. 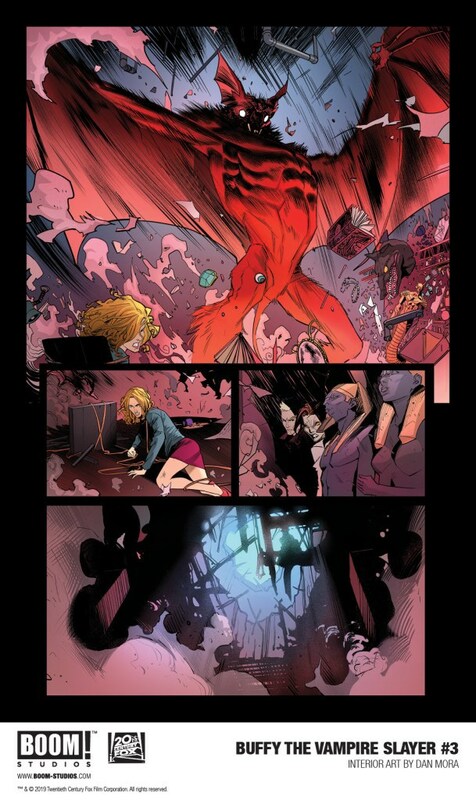 One thing I loved about reading the first issue of Buffy is that I felt the distinct movement of Buffy. Jordie, can you tell us a little bit about your collaboration with him? Bellaire: Dan is amazing. I was really excited to hear from Jeanine that she had gotten Dan for the project. I had already seen his stuff from Go Go Power Rangers, and know that he’s absolutely ridiculously talented. Then seeing him translate that whole kinetic energy that he has to his work into Buffy. Yeah, he’s just killing it. I think I’ve only given him one point of reference as far as clothes, and it was Willow will wear leggings. So I don’t know how much Jeanine helped him, but I want to honestly say that I think Dan took it upon himself to build this new updated universe and he just has a beautiful ability to demonstrate character and energy. Like we’re so lucky we got him. I personally think he’s amazing and he’s so perfect for the role. He’s so good! Nrama: Question for each of you - what are your individual, personal connections to Buffy? Did you watch it when it first aired or binge watch it? Bellaire: I use to love Buffy as a kid. When I was in college I properly binged the show because I have a problem with finishing shows. I get too sad. I can’t tell you how many tears I cried as an adult woman watching the end of Buffy. I actually didn’t want to watch Angel because I hated Angel on the show. Then I was convinced to watch Angel, again as an adult woman in my mid-twenties, and I was so wrong. This is an amazing everything. So the big connection to Buffy, which I wish I made younger, but I think because I made it so much as an older lady in my mid-twenties. I felt like I could appreciate all the things. Schaefer: Well I’m an old so I was in college when Buffy started, and I watched it from the beginning. Me and some of my girlfriends will all get together and pile into someone’s room and watch it every week. I really loved it. I felt like it was really formative for me - not just in terms of seeing a girl that could be flawed and also strong, to have agency and make decisions - to make bad and good decisions and there be no judgement on her for that, which is really incredible. I felt like there wasn’t a lot of that before Buffy that I was at least aware of. But also it was really informative to me in terms of serial storytelling – to see how things unfolded and the ways we talked about what we thought was going to happen and weaving together the monster of the week with the larger plot, the emotional core driving it through. Just on all levels it was really informative to me. When BOOM! called me to ask to come in and help them launch it, it was a no brainer for me. Nrama: For my last question, what’s your favorite Buffy the Vampire Slayer episode? Bellaire: I love “The Body." It may give you an idea of what I love about Buffy. It’s the sad, horrible thing where characters go on the edge of who they need to be and what they are. Then pushes them over that brink, and I think that final cut from “The Body” is probably one of my favorite cuts that I had ever seen in 10-12 years of television. It still sits with me to this day. I’ve only seen the episode twice but it just will be attached to my eyelids forever. Schaefer: I was going to say the same thing, but I’ll change it. But really quick, I felt Jordie was perfect to write this book because we have a very similar liking to having our favs suffer terribly. Bellaire: We are horrible people, Jeanine. Schaefer: I know! But here’s the thing you already said “The Body”. So my other favorite episode, which may give you a bit more insight into this book, which is “Once More, With Feeling." Bellaire: Yes! That’s my second favorite episode, Jeanine. Schaefer: I love it. I mean that’s everything. That’s the show. Right? And being a nerdy theater kid too, I mean are you kidding. That’s it. Thanks, comic. That virtue thing...you know, "patience." Where do I get a scoop of that for the Angel intro? At least I know you are still here and the "judgy" for the medium isn't quite as strange. Further, I do think the art is "just for us," besides the new kids on the block. Paper books require 150 mile drive for me, so I may have to relent to on line. BUT PEOPLE OF THE UNIVERSE! Comic has made "what counts" available for you right here. WAKEY WAKEY! It's clear that this is gonna be a bit different than days of your yore Buffy. I am having a little trouble with "voice"--they have Willow, the chatterbox, and Xander physically more demonstrative. Buffy is already all signed up with Giles' and is getting yelled at for being responsible when she was actually responsible. The quotes of MOW and some "emotional arc" might be a bit too procedural for my taste UNLESS the type of monsters "mean something" or help reveal the emotional problem in particular focus amidst all the normal chaos/drama. I wish somebody here cared about this site, other than the board mamas keeping it clean and alive and still so pretty for us. (Thanks for that, too). I don't want only bitterness in my mouth and hope to enjoy something that is (nostalgic?) a new approach. Old stories get told many ways and still "get the point across" in why they continue to be told. See you in the future? If not, in the pasture! Back, once again, to the Hellmouth, for the first time. It’s fair to say there was some trepidation going into this new start for the Buffy the Vampire Slayer. 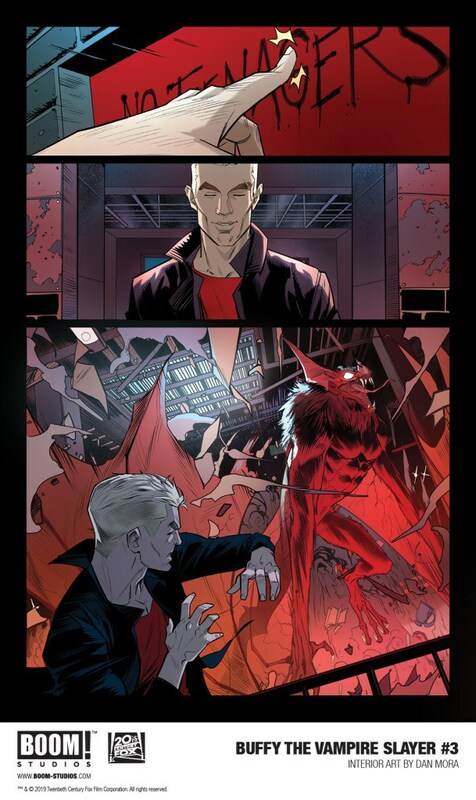 The transition from Dark Horse (the home of Buffy comics for close to 20 years) to BOOM! Studios meant a reboot, a term that doesn’t always sit easily with fans. With talks of a new beginning on the small screen for the Slayer, too, it seemed as though Joss Whedon’s shining star was no longer sacred. While the cult TV series ended in 2003, its world continued 2007 with Dark Horse's canonical Season 8. That ran until last year, when Fox pulled the comics license with Season 12. This BOOM! relaunch has more than two decades of continuity to contend with. Does it stand a chance? Yes, actually: Buffy the Vampire Slayer #1 is amazing, relevant and important. It feels immediately as if readers have been thrown back to the beginning, permitting them to experience it all over again. It's quintessentially "Buffy’" in a way that later seasons weren't. Writer Jordie Bellaire and artist Dan Mora are clearly using the TV series as a starting block, before sprinting off in their own direction, the seeds of which are planted here. With the (unfounded, in retrospect) trepidation also came the questions: Is this a new universe? Is this a full reboot or a soft relaunch? Will it be all-new characters or something familiar? The answers become clear as you work through this issue. This is all-new, but it’s also familiar. It’s a full reboot, right back to the beginning, but it’s set in 2019. Everything you know and love about Buffy -- the world, the characters, the humor, the heart -- are all here, but it all feels strange and, well, new. If you read the Mighty Morphin Power Rangers comics from BOOM!, you may be familiar with this feeling, as those comics pull off something similar, offering new takes on the setting, characters and stories beloved by fans. There are a few cheeky nods here and there to what’s come previously: Xander’s “Grr. Argh” as he imitates a vampire; Buffy telling Willow that “even she” could be a witch if she wanted to be; Willow asking about werewolves. Yet there’s nothing that goes out of the way to appeal to longtime fans. It would be jarring if the past were repeatedly referenced in tongue-in-cheek ways. This is a new beginning for everyone involved, and Bellaire embraces that. That’s not to say there aren’t things for longtime fans to love, however; the issue welcomes them with a warm hug. The faces and places look the same, and the character talk and behave the way we remember. The script has that perfect balance between weight and wisecracks, and the characters -- Buffy, Xander, Willow, Giles (plus a few surprising faces) -- are all there like you want them to be. Mora’s art goes a long way to making this feel like home, too. The original actors have clearly been referenced, but not to the detriment of Mora’s wonderfully expressive style. There’s no awful photorealism; instead, this has the essence of the actors without literally lifting from scenes of the show. 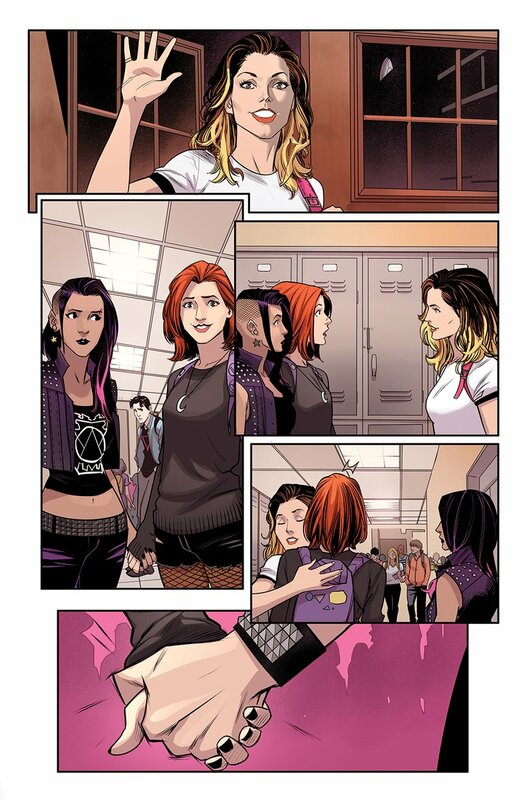 Mora injects energy into the characters that bring them to life in brand new ways, and the beautiful details in the establishing shots -- not to mention the backgrounds to every scene -- make it clear that Sunnydale is going to be as much a character as any of the cast. It would be easy for Bellaire to retread old ground with this series, and especially in this opening arc, but to her credit, there are multiple times in this issue where we veer drastically from its source. This is a new start in every way, and while it’s fun to witness past events unfold all over again -- the growing bond between Buffy and Giles, which is still so cold and confrontational here; the development of Xander and Willow’s characters, already markedly different from what we know -- what’s more exciting is seeing what is done now that the slate truly is clean. With this unpredictability is an energy that's not been felt in this franchise in years. Even the later seasons of the show didn’t shine as brightly as this issue, which might be considered sacrilegious in some circles, but nevertheless true. Whether you’re a new fan or old, reading through this debut feels like the first exciting step on a new adventure. 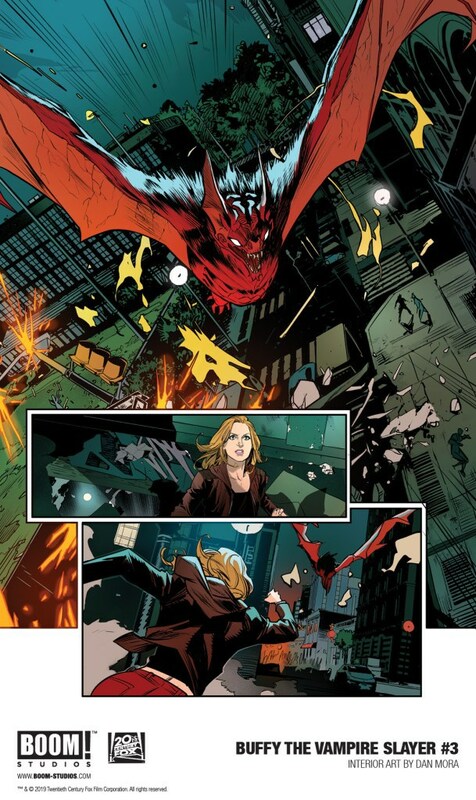 Welcome back to the Hellmouth, Buffy. We’ve missed you. 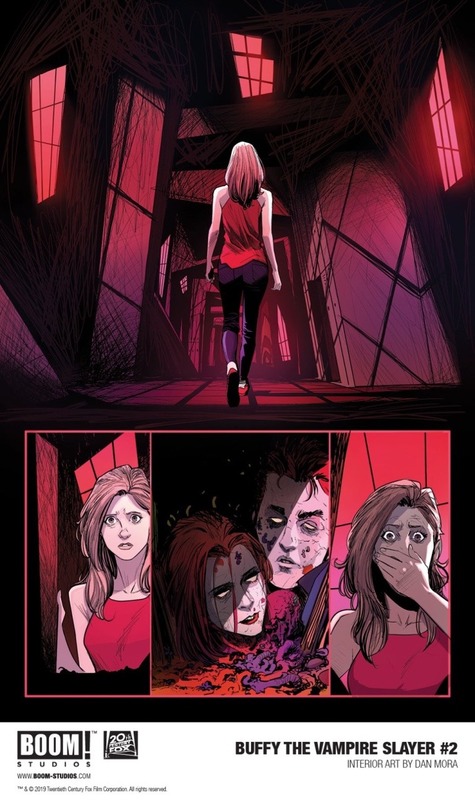 Preview pages for Buffy # 2. I am not sure if anyone is appreciative of this approach to Buffy, as years of “canon” and “fanon” has been one central part of fandom. I do take exception on the Photo realism used—see that Cordelia Chase cover cheerleading. Anybody can be a witch? Well, the writers did add, “if they want to.” (Suggesting “will” is important, which is true). Don’t you agree those nightmares are still her “prophetic power” (her intuition, based on the process of information and the subconscious “revealing” some possible outcome or deeper fears?). Everyone seems very fit; even Giles has no “weight of years of book study” in his posture or even his own struggles with this “weird slayer” and the COW (Council of Watchers). Seeing Buffy alone so much is a very different Buffy already and she isn’t very “smiley” ever, either. She has been slaying a lot and is already “settled” with Giles? Maybe her “being out there” is going to make her recognize the adults in her world simply don’t know her world at all? (Doesn’t every generation say that, and I am one who “takes seriously” that they are right—including the power of their relationships that are actually even more difficult to trust nowadays, I would guess. What seems “too easy” actually has the greatest consequence in the long term POV, I’d think. I finally have BOOM! Buffy # 1. I ended up not being able to get to my comic shop yesterday as I planed and ended up going this morning.I just finished reading the first issue. fresh and ending up finding it a fun film.I'm sort of divided on the recent news as a result.On the one hand,I would of been up for a sequel to that but at the same time,I'm looking forward to a proper Ghostbusters 3 that we're getting in July 2020. So with that said.What did I think of this first issue of the rebooted Buffy? I liked it.I thought it had the vibe of the original show but with a fresh paint job. I liked the new takes on the characters and their first meeting here. Giles is probably the most like the original version. the Wolfram & Hart mention. I think the art is good. Overall I enjoyed and i'm in for the rest of this arc at the very least. Buffy Sollicitation for April 2019. 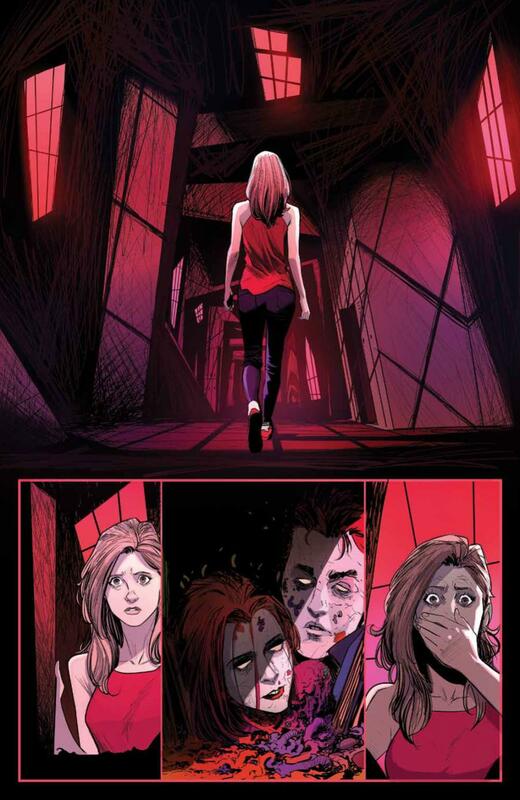 More Preview pages for Buffy # 2. 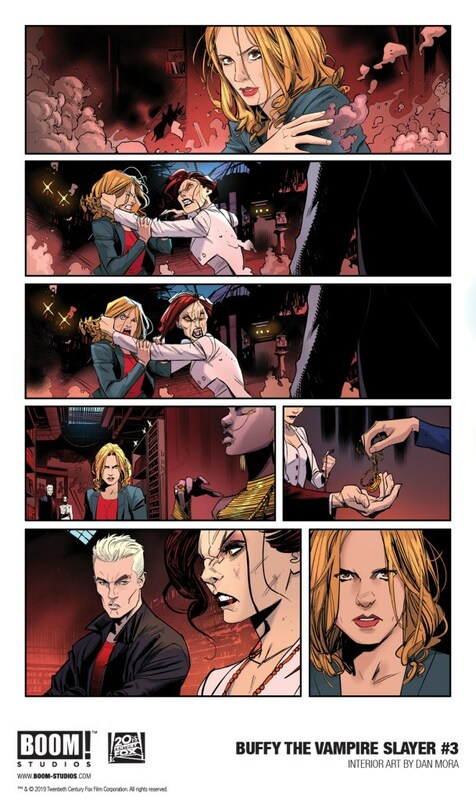 Preview pages for Buffy # 3. Anybody noticing the writers are being very careful to NOT introduce someone? Big 'French horn" intro (see Chosen, season 7 with Buffy on the ground looking up) or the big lurk in the shadows? Any thoughts on the Fanged Four, with Dru as opposition villain, or do you see Darla with a "momma's boy" /still with Angel hiding his 'soulness"; (avoid B/A altogether?) HOw about Angel as FEMALE? Yeah, that last one is a complete "snort." P.S. Agree on the art, comic, and the "reboot' as if the old world didn't exist is a whole 'nother story and one therefore can't expect these people to REACT the same. However, I think "choosing" has to have some standing from the old series to be recognizable in the nature of their 'problems" or to have any sort of literary metaphor in that "deeper, hidden, significant meaning" kind of way. So, I think some of these comics are fun 'just to have' for sentiment, but I think the power of "already settled" with Giles, etc. takes away a lot of the power for an opening. This is not mythic or epic, but is too much a "monster of the week" that will require "big stretches" of 'cuz I sez' for the biggest surprises to occur that can trip over its own shoelaces (cynicism). Yes, teens put on the 'hard boiled' knowing, but that 'scoured out' sense has to be shown as lived and will define where these people really want to take this Buffy. She will stand on her own two feet and yet will have also chosen those who make her trusted family, including the 'show' of her own "balance" within and with the world, in the independence of her power (and human right to actualization) to define her own solutions towards her own future. And that means it won't be the scoobs doing it for her OR Angel. Period. 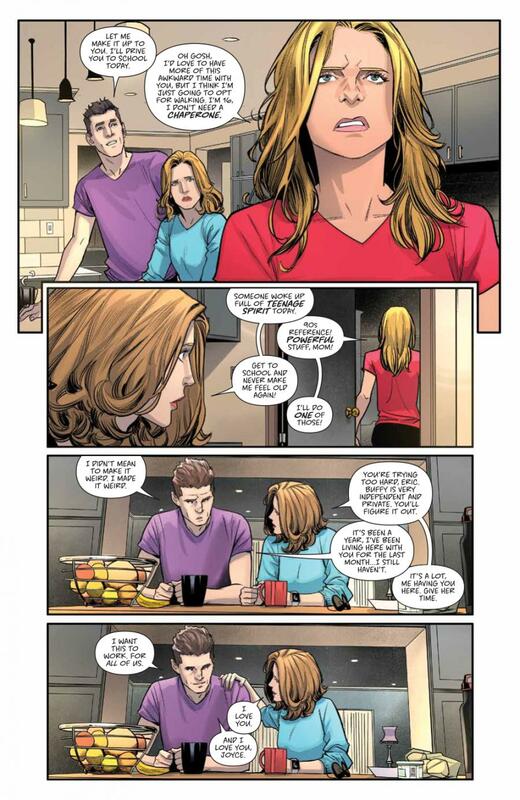 Buffy # 2 preview pages with dialog. It doesn’t happen a lot. Green Arrow after DC Rebirth was one. Immortal Hulk has been another. Thanos too. A couple of the Ahoy Comics titles of late. A continuing series that puts on sales is a rare beast. It generally means an underrated comic book with retailers unwilling to risk ordering non-returnable comics, given that it is expected that with every issue someone will decide to stop reading it. It’s called attrition and everyone seems to expect it. Which is why you get all those relaunches, as an attempt to persuade people to jump back on. Though it can also persuade others to jump off too. You get the big splashy launch and then sales diminish upwards of 50% between the first two issues and don’t stop falling with each subsequent release. And they definitely don’t increase orders from issue #2 to issue #3. Unless you’re Buffy The Vampire Slayer from Boom. Issue #1 sold out of its 41,000 print run. The secret variants are still selling for a nice price. And next Wednesday, issue #2 hits stores with the first appearances of Spike, Robin Wood, Cordelia and Willow’s new girlfriend Rose Yup. Right now that’s roughly 25,000 units sold. But issue #3, the one we told you ties to a pretty big surprise item shipping alongside the fourth issue? Rather than falling further, that jumped a thousand copies to 26,000 sold. It’s looking like Buffy The Vampire Slayer #2will end up being the rarest issue of the series if these sales continue to hold strong, as we’ve seen with sister series Firefly. And is expected to also sell out before it hits stores. Kinda makes you wonder what could be so big about that fourth issue, doesn’t it? The potential divisive new pairing Angel purist comment has me intrigued. Since this is a reboot,I'm more open to doing something wild or radical. Hmm,unless I missed it,I don't see the solicictation for the next issue which should be issue 5,I believe.